Once again we’re jumping the gun, putting the cart before the horse or whatever you want to call it to bring you a giveaway before we even lay EYES on this fun new DVD for kids. 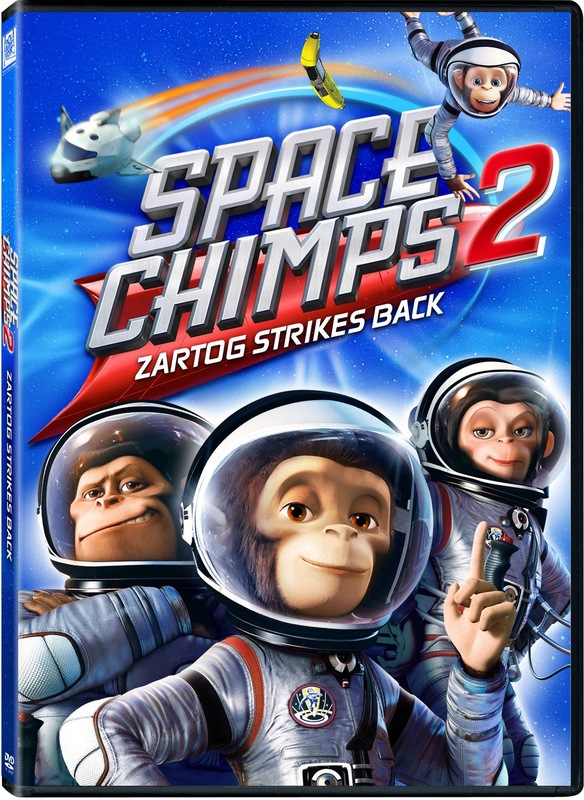 Space Chimps 2: Zartog Strikes Back is a fun flick that the entire family will enjoy. It’s filled with surprises and is out-of-this world. Once again bringing back their roles are the vocal talents of Jane Lynch (TV’s Glee), Zach Shada (Space Chimps), Cheryl Hines (TV’s Curb Your Enthusiasm), Stanley Tucci (Julie and Julia), Patrick Warburton (TV’s Rules of Engagement) and newcomers Tom Kenny (TV’s Spongebob Squarepants) and Laura Bailey (Dragonball: Raging Blast VG). Space Chimps 2: Zartog Strikes Back will feature both 2D and 3D versions and even comes with four pairs of 3D glasses so that you can enjoy it just as it was meant to be seen. This is the story of Comet, who usually gets left behind at mission control. He so wants to venture into space like his chimp-colleagues. Comet finally gets the chance to travel to Planet Malgor where he meets Kilowatt, and lives out his ultimate fantasy – exploring outer space. Danger ensues, when the alien ruler Zartog takes over Mission Control. This is Comet’s chance to SHINE and prove that he is brave enough to take him on. Comet joins his other chimps in space, Ham, Luna and Titan to save the day. Space Chimps 2 is available for purchase online at Amazon.com or your local DVD retailer. Follow Broad “Z” on twitter. Grab our badge from the sidebar and add it to your site. * Be sure to leave a comment letting me know if you’ve done any of these (if you already subscribe or have our badge – please note that in the comments as well). * This giveaway is open to US residents, 18 and over and ends on October 11, 2010 11:59 EST. I'm a fan of The Broads on Facebook. I follow Broad “Z” on Twitter. Subscribe to The Review Broads by e-mail. I am following Broad Z via Twitter as jlsc123.